Day 2: It's Revcon Time! This is another oddball from the SF Bay area. 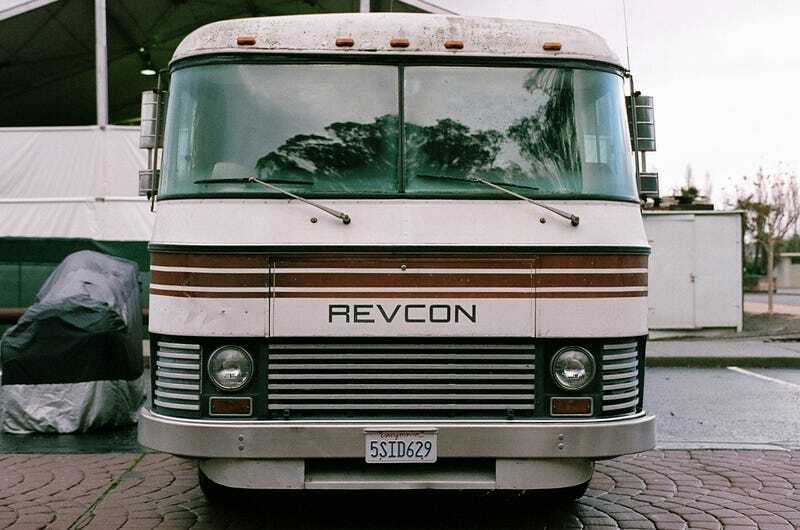 Ladies and Gentlemen, the Revcon RV. The Revcon was designed bu John Hall, who was the driving design force at Aristream for many years before doing his own thing and making RVs. This one is fairly early, but later models adopted a sleek aero fiberglass nose section. Personally, I dig the aluminum box. Unlike most RVs of the time, the Revcon did not use a steel c-channel chassis but rather aluminum box section making for a much stiffer frame. It also had no driveshaft, because it was front-wheel drive. This allowed the Revcon to have a lower center of gravity, which improved handling. It’s not a very high bar, but it’s something. Revcon RVs were designed around the engine and front axle from the 1968 toronado. GM didn’t believe that it would be a strudy enough assembly, so Revcon tested the whole thing and found it to be more than strong enough. A few years later, with Revcon having proved the concept, GM started doing the same thing on their RV designs. The Revcon also used aluminum skins on the interior and exterior with several inches of dense fiberglass in between. They’re light, comfortable, and no one’s ever heard of them. They also appear to age very well, even when not maintained (like this one). For more on the Revcon, check out Revcon.org. For more pictures, check out #iamNOTthespeedhunter on Twitter.